Mascot character board game coming to Switch. Bandai Namco has announced Gotouchi Tetsudou for Nintendo Switch. It will launch in Japan this winter. 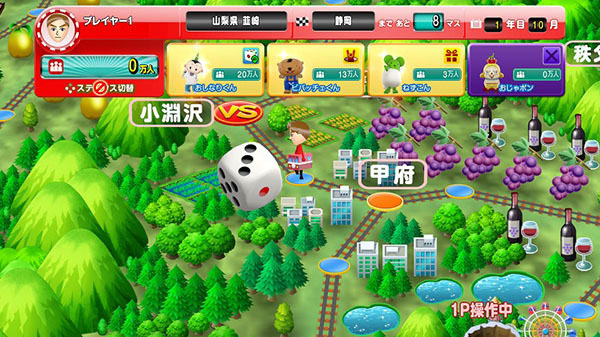 Previously released as Gotouchi Tetsudou: Gotouchi Kyara to Nihon Zenkoku no Tabi for Wii U and 3DS, Gotouchi Tetsudou is a board game that tasks players with becoming the best local mascot character producer in Japan by joining up and traveling with various mascot characters, and building up a fan base. Original Mascot Character “Angel Ojapon” – Ojapon, the self-proclaimed “mascot king,” transforms into “Angel Ojapon.” He appears as a support character that helps the player in last place, but leaves as the player rises in rank. New Events, Mini-Games, and Productions Added – Enjoy new events, mini-games, and productions not included in the previous game. Voices for Game Original Characters – Voices have been implemented for game original characters such as Ojapon, Angel Ojapon, Gotouchi Oneesan, and Gotouchi Tetsuo. Ojapon and Angel Ojapon are voiced by Masako Nozawa.